informative materials on your products or services. 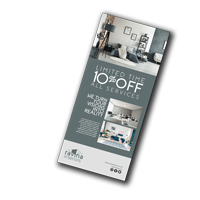 Entice customers with informative and attractive rack cards that show off your products or services, its affordable prices, and exclusive discounts. Display distinct designs of your takeout menus, museum exhibits, or church worship services in areas your customers frequent. Every rack card they take home brings them closer to your business. Choose from the lightweight 10 pt. cardstock or the extra thick 16 pt. Need a writable surface? Our 14 pt. cardstock comes with an uncoated option on the back or both sides. Need a little more sparkle and shine in your brochure rack? Our metallic rack cards print shiny accents in any color. Complement the lustrous element with an uncoated surface or make it extra vibrant with high gloss UV coating. 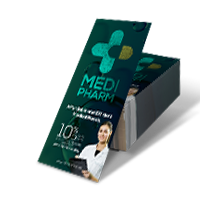 Attach a tearable coupon or special promo to your rack card design. This additional feature encourages in-store visits or helps drive traffic to your website. Scoring and perforation options are available for our custom rack cards. All our product pages come with rack card templates you can download for easy design creation. Our print experts are available to answer any questions you may have about the order process.